Home » Health » LV3 Acupuncture Point Linked To Helping Insomnia And Other Sleeping issues! LV3 Acupuncture Point Linked To Helping Insomnia And Other Sleeping issues! More and more Americans are suffering from insomnia, a condition which further causes other health problems and makes us unable to work or perform everyday activities normally. Maybe there is no miracle button to push which will make you immediately fall asleep, but applying pressure to certain acupuncture points can improve the quality of sleep and help with insomnia. This Chinese technique has been use for centuries and shared with people suffering from similar problems. Amongst the many points on our body, three acupressure points have effects on the sleep. As explained by Modern Reflexology, the point known as LV3 or the Great Rushing is considered to be the top healing point for every problem and condition, insomnia included. 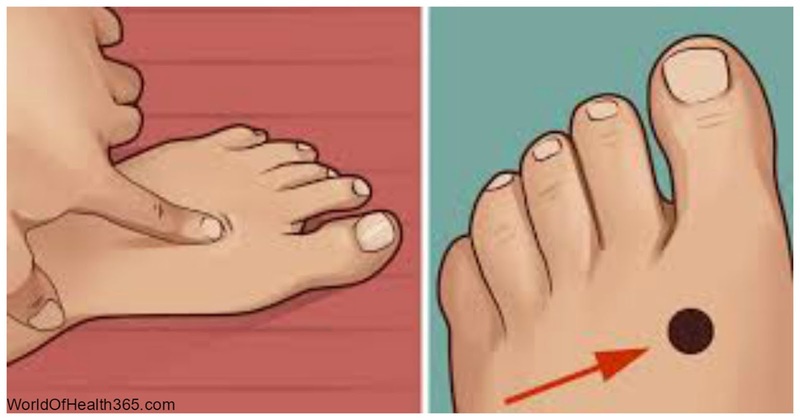 It is situated on the webbing between big and second toe, on the fleshy foot top. Recommended technique for fighting insomnia is applying a firm pressure on the LV3 point for 4-5 seconds. Other two points for treating insomnia are K1 (Bubbling Springs) and P6 (Inner Gate). The first one, K1 is located on the bottom of the foot, at the center of the indentation below the foot ball. P6 is 3-fingers width above the wrist, between the tendons. Hold the K1 for 30 second, release for 5 seconds and again hold for 30 seconds. P6 is to be hold for 5 minutes, then release. An acupuncture specialist, Dr. Maoshing Ni, recommends repeating the treatment for 5 minutes. The National Sleep Foundation is sharing some practical tips which can help reduce stress and get a better sleep. Set a specific time for going to bed and waking up, and make it a routine, it will break the insomnia cycle. Also practice a relaxing and calming ritual before going to bed. Don`t nap during the day, it will interfere with you night sleep. Calm your whole body and mind down before trying to get some sleep and if you still can`t, go somewhere else, do something until you feel sleepy enough to return to bed. Don`t smoke, eat big meals, drink alcohol or caffeine drinks before going to bed. These are only tips and recommendation, not a guarantee of a successful all-night sleep. Try some of them or combine them as needed, maybe something will bring results.